Discussion in '9/11' started by trevor, Oct 14, 2014.
jazzy, im an investigative journalist. just curious, you don't happen to be a structural/civil engineer do you? and jazzy, just for future debates, if someone is claiming the towers were demo'd, just show them this picture. you're pretty much guaranteed to not get a reply back from the person you show this to. jazzy, im an investigative journalist. just curious, you don't happen to be a structural/civil engineer do you? Nope. Aero-engineer and industrial designer. Retired and working on a Jazz Bass right now. just show them this picture. Thanks. I was entirely aware of the buckling but have never seen the inset, which is GREAT. I shall definitely use this to such a purpose. Of course the official explanation is that the trusses caused the inward bowing (pull in) mis-labeling the buckling which was caused by over stress axially of the facade columns... two very different things. This gif puts a lie to the idea of the trusses as the cause of what is called IB. The walls could only buckle inward because the floor trusses had already had their tensile members lengthen due to creep under load and ceiling temperatures, causing the floors to sag, snap their fixings, and drop away. The floor behind the infolding face was either NOT there, or FULLY COMPLIANT to that inwards movement. If you squint at it carefully you can see that transferring loads are making the tower SWELL beneath this failure - which is a classic failure by buckling. But it was brought on by the floors, all of which sagged and several fell, due to those exposed trusses. A floor failing above or beneath an already-fallen floor would very nearly defeat even a 1000% stability safety margin and COLD steel. Not quite, but, of course, in the event the steel was especially hot at the floor/ceiling undersides. So how does this "gif put a lie to the idea of the trusses as the cause"? But it was brought on by the floors, all of which sagged and several fell, due to those exposed trusses. A floor failing above or beneath an already-fallen floor would very nearly defeat even a 1000% safety margin and COLD steel. Not quite, but, of course, in the event the steel was especially hot at the floor/ceiling undersides. So how does this gif put a lie to the idea of the trusses as the cause? I think the floors slabs inside the corner had collapsed or lost their integrity... Perhaps parts hanging on the the facade causing a moment which "directed" how the facade buckled. To buckle out there would have to be a *helping* force pushing from inside... impossible for the geometry of the corner slab which was a rectangle... it can't grow in size. The facade corner column is failing in the gif. The whole building is coupled together trying to apply rearranged forces throughout itself. A reductionist approach won't reveal what happened here. You are right about torsional forces. The original energy is linearly-directed and will take every chance to obtain rotational energy from the kinetic. It has to happen in buckling, which requires a sideways movement to begin. Buckling IS sidesways motion it defines buckling... this is a bit of a semantic matter. Buckling is caused by axial loads exceeding capacity. You can make a column buckle by pulling it out of column.. so to speak. Sagging in wrong axis in that last photo... why? because the connection to the facade at the point where it is sagging was destroyed... This is NOT what NIST said... this is 90° off! Just a few observations on this thread. First of all NIST says that the trusses sagged 47" which using trig and/or geometry is needed to create the triangle that would be created to enable the outer walls to be pulled inwards by the distance observed. NIST also must postulate that every truss must sag by that same amount around the entire building - and at the same time - and very rapidly. That is in direct conflict with the reports by Kevin Ryan who was privy to the results of actual trials in a furnace where he worked. He says that despite double the load and double the time being applied to the test that trusses actually sagged only 4". You will recall that he was concerned that NIST was using incorrect figures in their analysis and was disturbed that his protests via his own company were not being heeded. After going directly to NIST he was silenced by losing his job. We must accept that a 4" possible sag is insufficient to demonstrate the large inward bowing seen. Secondly, an alternative reason for the observations must be considered. The main contender is that the core of the building was attacked in some way causing it to move downwards in isolation to the outer walls. A direct indication that this occured is the way that the antenna on WTC1 is seen to be move down before any inward bowing of walls is seen. As the antenna was sat on top of the hat truss which itself was sat on top of the core, then it would indeed seem that the core moves down before any inward bowing of walls is observed. That is not sagging trusses causing inward bowing but is rather one of intact trusses being pulled downwards from the central core connections and the outer ends of those trusses causing outer walls to bow inwards. As all trusses are connected to that inner core complex it follows that if the core moves downwards it would also pull every truss downwards with it. If all trusses are pulled downwards simultaneously that would cause every wall panel attached to them to be drawn inwards. As observed. The combination of a fraudulent claim of 47" sagging - the need for all trusses to sag 47" instantly - and to do that simultaneously - makes that contention less attractive that the alternative of a dropping core which explains more elegantly what is seen. Ockams razor at work. I can only partially agree with hitstirrer. He is correct that it is absurd to accept that all trusses experience even heating and failed simultaneously. And correct that the initiation was core centric... But incorrect to assume that only some sort of placed devices used on the 47 core columns explains the observations. The core most likely experienced a period of progressive loss of capacity driven by heat and the initial mechanical damage from the plane strike. Heat not only lowers the strength of steel but it also deforms it... causes it to expand. I suspect it is the latter - expansion which led to warping and lateral movement and ultimately mis alignment of columns ends leading to web and flange crippling and column failure from buckling. This process was occurring mostly at the core in the floors of the plane strike and above. As it progressed a failed column above would go from a compression member to one in tension hanging from the hat truss above. Or more likely when it changed from compression to tension the column to column and column to hat truss parted/failed. And with it the floor area around the failed column line in tension dropped. This did a few things.... slowly gutted the core and removed the axial support that these columns provided for the hat truss, allowed voids which facilitated the movement of other columns into that gap. Eventually over time the hat truss was like a bridge spanning the top of the tower and that bridge losing support as the columns at the core's perimeter failed from warping and lateral displacement dropped below service capacity and the core sides of the OOS floors all plunged inward like material at the perimeter of a widening sink hole does. In the final instant the remaining facade also saw a spike over capacity via the hat truss and it buckled, translated laterally because of the slight assymetry of the above process and dropped. ROOSD began in those final moments as the floors tumbled down outside the core and the displaced misaligned facade dropped and severed the remaining OOS to facade connections. Without suppressing the heat this would be the inevitable out come... gutting of the core below service capacity... or whittling away of FOS to below 1. But incorrect to assume that only some sort of placed devices used on the 47 core columns explains the observations. I was careful NOT to say that I assumed the placing of devices. I specifically said " the core of the building was attacked in some way". It is you who has assumed that I said devices. Interestingly, you agree that the core downward movement would seem to be the likely culprit for the observed inward bowing, by every truss attached to that core pulling downwards and inwards. Unfortunately you now also disagree with NIST who specifically claim that it was trusses sagging 47" that caused the outer walls to bow inwards and that initiated the collapse. You will be aware that NIST's investigation also ceased at that point. They say that trusses sagged 47" -pulled walls inwards and that total collapse was then inevitable. End of. And the world must be satisfied with that. It would seem that you disagree with NIST and have postulated a different theory. You could be right. For certain you are MORE right than NIST. I don't hold a brief for NIST. I find their explanations for initiation make no sense. My theory is to make sense of what I observe and basic established principals and behavior or materials in the observed environment of un controlled fires. I don't believe NIST did a scale model to see how the core BEAMS would behave when heated and simply looked at a truss failure scenario. They looked in the wrong place! By the time the floor slab failed... the core was already a goner and the cause of the floor drops... My view. That leaves the shell with no way to support the core, that lower floor causing the bowing inward. Floors sag a lot in fire, image they with fire proofing ripped off, fire proofing fingers could dislodge under the floors. NIST and others did the numbers for their claims, no one with opinions has the math, just opinions based on speculation. 3 feet of sag from office fires. Fire does a number on steel. 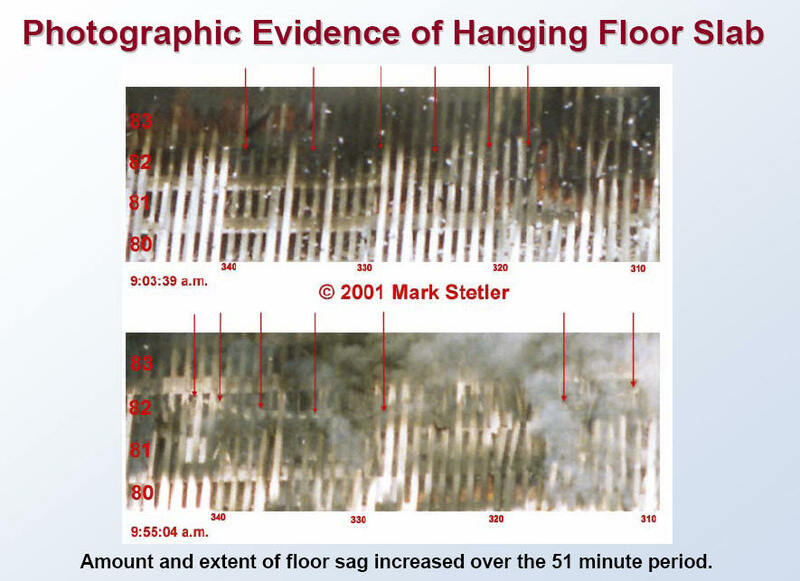 nist claimed that the sagging floor slabs pulled the columns inward which ignitiated the collapse...such as this. Don you really think the floors pulled the facade on the north and east sides... maybe 30 - 40 feet and that collapsed the upper part? Didn't that upper part fall to the SE? Who cares what NIST said.... they seem have gotten this very wrong. Some context on what they said. Inward bowing of the exterior walls in both WTC 1 and WTC 2 was observed only on the face with the long-span floor system. 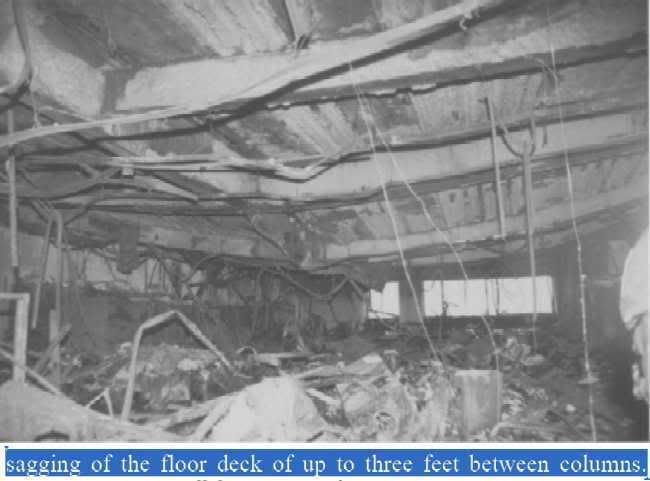 In WTC 1, this was found to be the case even though equally extensive fires were observed on all faces. 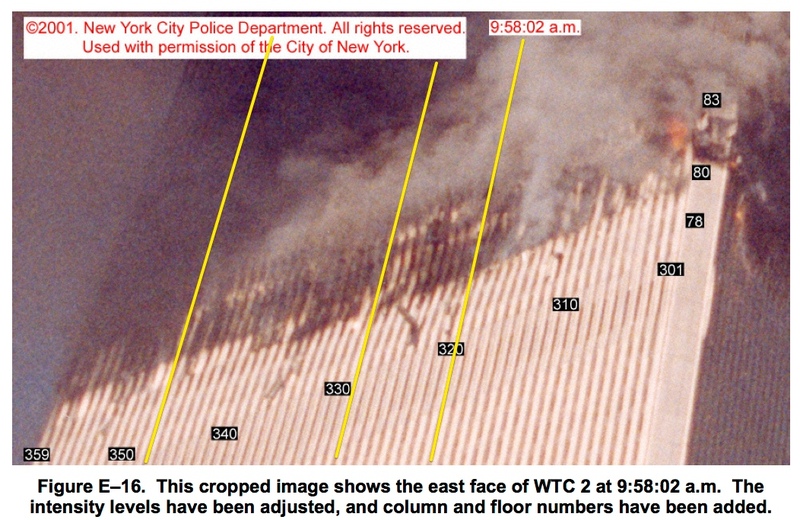 In WTC 2, fires were not observed on the long-span west face and were less intense on the short-span faces than on the east face. Inward bowing was a necessary but not sufficient condition to initiate collapse. In both WTC 1 and WTC 2, significant weakening of the core due to aircraft impact damage and thermal effects was also necessary to initiate building collapse. (b) between the core and exterior walls via the hat truss and, to a lesser extent, the floors. The aircraft impact severed a number of exterior columns on the south wall from the 78th floor to the 84th floor, and the wall section above the impact zone moved downward. After breaching the building’s perimeter, the aircraft continued to penetrate into the building, severing floor framing and core columns at the southeast corner of the core. Insulation was damaged from the impact area through the east half of the core to the north and east perimeter walls. The floor truss seat connections over about one-fourth to one-half of the east side of the core were severed on the 80th and 81st floors and over about one-third of the east perimeter wall on the 83rd floor. The debris severed four columns near the east corner of the north wall between the 80th and 82nd floors. The impact damage to the perimeter walls and to the core resulted in redistribution of severed column loads, mostly to the columns adjacent to the impact zones. The impact damage to the core columns resulted in redistribution of severed column loads, mainly to other intact core columns and the east exterior wall. The hat truss resisted the downward movement of the south wall. As a result of the aircraft impact damage, the core carried about 6 percent less gravity load. The north wall carried about 10 percent less, the east face carried about 24 percent more, and the west and south faces carried about 3 percent and two percent more, respectively. The core was then leaning slightly toward the south and east perimeter walls. The perimeter walls restrained the tendency of the core to lean via the hat truss and the intact floors. • Under the high temperatures and stresses in the core area, the remaining core columns with damaged insulation were thermally weakened and shortened, causing the columns on the floors above to move downward. At this point, the east wall carried about 5 percent more of the gravity loads, and the core carried about 2 percent less. The other three walls carried between 0 percent and 3 percent less. The long-span floors on the east side of the 79th to 83rd floors weakened with increasing temperatures and began to sag. About one-third of the remaining floor connections to the east perimeter wall on the 83rd floor failed. Those sagging floors whose seats were still intact pulled inward on the east perimeter columns, causing them to bow inward. The inward bowing increased with time. As in WTC 1, the bowed columns buckled and became unable to carry the gravity loads. Those loads shifted to the adjacent columns via the spandrels, but those columns quickly became overloaded. In rapid sequence, this instability spread all across the east wall. Loads were transferred from the failing east wall to the weakened core through the hat truss and to the north and south walls through the spandrels. The instability of the east face spread rapidly along the north and south walls. The building section above the impact zone (near the 82nd floor) tilted 7 degrees to 8 degrees to the east and 3 degrees to 4 degrees to the south prior to significant downward movement of the upper building section. The tilt to the south did not increase any further as the upper building section began to fall, but the tilt to the east was seen to increase to 20 degrees until dust clouds obscured the view. The downward movement of this structural block was more than the damaged structure could resist, and the global collapse began. So I'm not quite clear on what you think they got wrong. For me, this reads like the sagging caused bowing. This (combined with core damage) then led to the much more dramatic buckling seen in the gif. It may read like that but that is incorrect in my opinion. The IB is a result I suspect of there being no lateral resistance from the floor system at various location... this was manifest as inward bowing.... if the missing floor was over a considerable distance... Why would some floor to facade connections fail and others remain strong enough to yank those massive columns inward? Makes no sense. The bolts would shear before the columns would bow. THAT is something that could be tested full scale on one panel modeled from the 80th floor. Pull it with a couple of 1/4"x3"x3" angles bolted with 2 -5/8" bolts and see what happens... the facade bows or the bolts shear.. or the weld plate is ripped off. It may read like that but that is incorrect in my opinion. The IB is a result I suspect of there being no lateral resistance from the floor system at various location... this was manifest as inward bowing.... if the missing floor was over a considerable distance... Why would some floor to facade connections fail and others remain string enough to yank those massive columns inward? Makes no sense. The bolts would shear before the columns would bow. THAT is something that could be tested full scale on one panel modeled from the 80th floor. Pull it with a couple of 1/4"x3"x3" angles bolts with 2 -5/8" bolts and see what happens... the facade bows or the bolts shear.. or the weld plate is ripped off. Sounds like a good candidate for some FEM analysis. ..The combination of a fraudulent claim of 47" sagging - the need for all trusses to sag 47" instantly - and to do that simultaneously - makes that contention less attractive that the alternative of a dropping core which explains more elegantly what is seen. Ockams razor at work. A word of caution in connection with Inwards Bowing ("IB") and the causality of floor joist sag. There has been much controversy based on the geometry of the presumption that floor joist sagging must cause all the observed inwards bowing. Not so. all that the joist sag needs to do is to start the inwards bowing and reach the critical point where the misalignment of the column cause it to self buckle under the applied axial load. From that point the IB will progress of its own volition due to axial load. The floor joists may sag further but the extra joist sagging caused by the IB not vice versa. That is one of those "bleedingly obvious" facts than many - including engineers - have not recognised. The issue is usually labelled "p Delta" - how much out of line (delta) a column needs to be given an applied axial load (p) so that it will buckle under that axial load. The alleged need for all trusses to sag instantly is a chicken and egg red herring. If sufficient sagging trusses cause the inwards bowing of some perimeter columns then the stiffness of the column and spandrels combination will tend to make all bow inwardly. And that bowing will ensure that all floor joists sag the corresponding amount. So reversed causality for some columns/joists. Chicken and egg as I said. Agreed - but it is a darn sight more complicated than it looks. I’ve seen two engineers - one "truther side" one "official side" go at each other with competing FEA's on this topic. BOTH of them let it be simplified to ONE joist pulling in ONE column. Totally ignoring the 3D interconnectedness of all columns and floor components. Both resented my comment - since I'm a slide rule era engineer (The "41" is the clue) and I don’t profess FEA fluency. The truther side engineer after some discussion finally agreed with me. And retired from forum posting. The "official" side engineer still doesn't. And he is still wrong. The causal issue IMNSHO is that we train engineers to build safe static structures - within conservative code standards. The dynamic setting of a collapse is two orders more complex. Some can handle it some cannot. And that is a topic for a different thread. the one and only thing that i do NOT understand, is how the building was able to crush the majority of the building (falling nearly straight down almost pancake style)...i would have figured that it would have only made it HALF way down...not 95% of the way. and by that, i mean almost half of the building should still be standing. anyone know how far down the steel weakened? was it effected near the bottom as well? i understand the fireproofing was blown off. once the collapse is underway (and has picked up sufficient momentum, which will have happened after a sustained drop of not very much - somewhere between several inches and several feet), the structure below will, by and by, experience dynamic loads that exceed wkat it was designed for to bear (mostly statically; and, to a lesser degree, dynamically) by an order of magnitude. Think of how you can stand on a tin can for indefinitely long stretches of time, even move upon it, but when you jump on it from a few inches up, you will crush it - and crush it all the way down to the floor. Once the first layer of steel structure below the falling part fails, it starts falling along with the stuff on top and add to the mass as gravity keeps pulling. Rinse and repeat, as the now acreted mass impacts a next layer of structure. If the absorbed energy exceed the picked-up energy, there is a chance for collapse arrest. If picked-up energy exceeds absorbable energy, collaps will go all the way down and accelerate. This scenario is quite independent from how damaged the structure is - doesn't require any fire effects. You see, in actual controlled demolitions, they don't pre-heat the entire building (they do weaken columns and other supports to facilitate and controll the collapse, but that is not a necessity for the method to work). It is rather easy to come up with mathematical models that envelop the actual situation by presenting a "best case for survival" scenario and showing that even the best case predicts total collapse, once collapse is under way. The effects of high temperatures (steel weakening and/or expanding; later, as fires move on, contraction of cooling steel; perhaps compromising of auxiliary structures like concrete floors that help stiffen the floor trusses) were important to initiate the collapse, to bring the static load-bearing capacity of the first level of structural elements below its actual load, to send it moving down. After that, it's collapse progression. (Some put a "transition" phase between the two; I guess that's supposed to be a phase where progression is mainly lateral through the failing level and up to the point where vertical progression across the entire floor area becomes dominant). "Official" theory says that fires, possibly helped by stripped fire-proofing and plane crash damage, initiated the collapses, and that after that, progression is unavoidable without further ado. "Conspiracy theorists" variously claim that either initiation wasn't possible/did not happen by fire alone, or that progression wasn't possible/did not happen without assistance by explosives/incendiaries/space rays; or both. Sorry if that was too detailed and perhaps too low-level. I hope it helps anyway. The ROOSD collapse would have progressed as seen if the tower were 200 stories of 2000. It was the crushing destruction of the floor slabs by a mass impinging on them from above which are exceeded their capacity to support the load. If a 10,000 pound person steps on a trampoline it will be destroyed. If there were a stack of them each one would break. The analogy fails because in the trade center towers the trampoline membrane is the mass.. and that mass grows with each destruction. It was more of a vertical flow or avalanche than pancakes. You don't seriously think 50 floor slab masses could be piled up on floor 50 do you?. The floors were designed for live loads of less than 100#/ft. I know y'all like to expound at length on every aspect of 9/11, however this is the "inward bowing" thread. Let's try to keep on topic. NIST describe the transition from bowing to buckling as the collapse initiation. i.e. when the columns began to deform under axial loads, they have essentially failed, so they (rapidly) continue to buckle. Are you describing a third stage between the sagging joists bowing, and the catastrophic buckling, where the columns buckle, but the load is redistributed, so it simply magnified the bowing started by floor sagging? I think the gif that started this thread is largely showing the final buckling as the building top tilts to the SE, and not the bowing. Although, thinking about that some more, if this middle stage bowing+buckling were axially induced, wouldn't that require the upper structure to be leaning? Axial load is not going to make something bow without the upper load moving down. Clearly that's happening in the collapse. But was there a pre-collapse lean on WTC2? I know there were reports of WTC1 leaning several minutes before collapse. 10:21 a.m., they said that WTC 1 was buckling on the southwest corner and leaning to the south. By 10:18 a.m., a substantial pressure pulse inside the building ejected jets of smoke from the 92nd and 94th through 98th floors of the north faces and the 94th and 98th floors of the west face. Fires raged on the south side of the 96th through 99th floors. The sagging of the floors had increased. Although the floors on the north side of the tower had sagged first, they contracted due to cooling when the fires moved toward the south. Now, the south side floors had sagged to the point where the south perimeter columns bowed inward (Figure 2–12). By 10:23 a.m., the south exterior wall had bowed inward as much as 55 in. The tower was being overwhelmed. Three of the four major structural systems—the core, the floors, and the perimeter walls—were weakening. The south wall became unstable and tried to transfer its remaining load to the weakened core via the hat truss and to adjacent perimeter columns via the spandrels. The entire section of the building above the impact zone began tilting as a rigid block toward the south. The upper section of the building then collapsed onto the floors below. Within 12 s, the collapse of WTC 1 had left nothing but rubble. I have no problem with that statement - it is essentially the same comment that I was expanding on. Restating it - "when the joist pull in caused the columns to begin to deform under axial loads, the bowing reaches a critical point where the columns have essentially failed, so they (rapidly) continue to buckle..."
No. We are slightly at cross purposes. I was only describing a two stage process. A column subject to axial load as per design intention. Then a superimposed pull in load from joist sag which causes the column to start to bow - stage 1 - which progresses to buckle once it passes a critical point - stage two. totally consistent with what I see as your position BUT trying to explain to greater detail. Recall I was responding to this comment by hitstrirrer "..The combination of a fraudulent claim of 47" sagging..." I am aware from other places that the "fraudulent" and "47 inches" have arisen where claims have assumed that joist pull in alone was the cause of the full inwards movement observed. Not making the distinction which you ascribe correctly to bowing plus buckling. Agreed. However those discussions which make the single cause error conflate bowing and buckling. Your distinction correctly avoids the risk I was identifying. I think hitstirrer's comment made the error or at best left it open for the error to be implied. Hence my cautionary comment. Oops. missed this post Mick - took me some time to compose the previous and we crossed in posting. You have opened the can of worms - the understanding of the very complex 3D dynamic event which was the cascade failure of the collapse initiation stage. You identify the problems of interconnectedness. I doubt that we can satisfactorily describe it in words on a forum - and 3D visualising is one of my strong point skills as an engineer. I am not aware of anyone addressing it in any of the detail that your thinking requires. And I've given it a lot of thought over the years. I think I've got my head around much of the complexity. That doesn't mean that I can explain it in typewritten words on a forum. Nor does it mean I've got it all right even if I could put the thoughts in writing. However lets see if we can start the discussion. One big context issue is the massive 3D interconnectedness of the structural elements. The second big issue is that design approaches are based on being safe to conservative code standards in what are essentially static conditions. The dynamics of collapse makes the situation a couple of orders more complex to understand or explain. It is way outside the nine dots of normal engineering practice. You have identified that nothing can move without other parts being affected. Let me see if I can start discussion by identifying a few parts of the overall picture. Potential building blocks ["BBx"] for understanding. BB1. Recall that I commented adversely on an example where two engineers using FEA on this very topic - joist pull in related to column bow/buckling. They simplified it to one joist one column. No way is that valid. If you try to pull in one column its connections to other columns via spandrels will shift some of the load to the adjacent columns. And the shifting will be most to the immediate neighbour columns progressive less on more remote columns. BB2 Another example - if one column is cut the load it carried will redistribute most to neighbour columns but some - getting progressively less - to more remote columns. Those two relatively easy to comprehend. Not so easy to quantify but manageable by FEA provided we can specify the starting points which isn't as easy as it looks. But lets look at a more complicated example. BB3 A column is approaching overload which will cause it to buckle. But for it to go into overload it has to get shorter under the compressive stress. How does one column in a closely tied grid get shorter without the adjacent columns getting shorter? Clearly for any column to get shorter - prelude to buckling - it's neighbours must also get shorter. So load redistribution and shortening interact. And it is 3D - so those interactions are 2D redistribution. No answer at this stage but all those examples are structural element level examples. Let's go up one level to a more macro scenario - you mentioned "tilt". Tilt at WTC Twins resulted from columns failing more on one side than on the other. Conceptually easy. BUT what was the load redistribution? I'm not going to try to go further at this stage. But I will identify that this is the area where the "big names" have got it wrong. Bazant after his Bazant & Zhou paper of 2001-2 has written a series of papers with various associates. Using the one dimensional assumptions from B&Z 2001-2. Wrong. Reasons later if needed. From the Truth side Tony Szamboti's magnum opus is the paper "Missing Jolt". It makes the same Bazantian assumptions and is fatally flawed for that reason among others. Both try to use 1D approximations for an event - a mechanism - which is essentially 3D and cannot be explained in 1D - again supporting reasoning later if needed. As I said - you have opened the can of worms. It is the overal topic of which this topic of inward bowing is only one of many parts. So I doubt that it is "on topic" - far too broad IMO. Do we have an extant other thread? Or put the lid back on the can and pretend it never happened? The IB is a which came first the chicken or the egg problem. Columns can buckle without them bowing. A normally straight column bowed IS buckled. We think of a buckled column the result of loads exceeding its axial capacity or being eccentrically loaded.. such as all the *design* load impinging on one flange for example for a WF column. In fact adequate bearing area is required for a column or a beam to perform... transfer stress (loads). Inadequate bearing will lead to web and flange crippling. The facade columns were loaded from above... axially and from the side... laterally. Laterally the floors were attached on the core side and the winds pushed on the toward the core. The slabs and trusses acted as compression member supported the facade columns resisting wind pressure. The mass of the floors added a moment to the core side of the facade columns. There were no lateral forces pushing the columns away from the core... except in the ROOSD collapse phase when air was pulled into behind (above) the crush front and the gathering mass pushing outward against the facade cage. Before collapse the official explanation would have us believe that the floor system pulled the facade inward. With an intact core structure this would be impossible... the floor could not shrink in its facade to core dimension. If it acted like a catenary in tension... the slab would exert a pull in where it was supported... one side at the core and once side at the facade. We are told perhaps the core held presumably because it was so well braced... and the catenary pulled only the facade. 3. that the aggregate profile of the steel of the facade at the level... 6 x 13.5" x .5" (I leave off the webs - of the same profile) could be bowed inward pulled by the floor system. I have not done the math... but the few trusses pulling at all these steel and the connections not failing and the steel blowing like it's taffy seems implausible. Therefore I think what we see is the facade buckling... but that needs to be explained because to buckle those panels would have to see more load or have some loss of strength or both. The direction of buckling makes perfect sense because of the geometry of the static forces. It should be noted that in the debris there are many examples of bent over bearing plates... pull through connection failures of bolts at the spandrels where the trusses were connected. These of course could result from other causes... ROOSD... but the failure mode of the connection is there. I would posit that the facade buckled and in locations where there was excessive loading. Where did these new loads come from? I would assert the were the result of redistributed loads via the hat truss in most cases... The core was being weakened by a combination of processes.... initial loss of axial paths from plane damage... followed by elongation of the bracing from the heat from fires ranging over multiple floors. This enabled the braced to nudge the column ends out of alignment..the normal service load on these slightly misaligned column ends... 1/2" is all it takes would be in 3% of the bearing contact and cripple the web and flange of the top column (buckle it) which would then see the entire line of columns above it begin to drop... all the bearing connections of column to column would likely fail... they were designed to simply align the two columns for bearing purposes... not as hangers in tension. The hat truss would lose some of it's support and might see a momentarily increase as the falling column line pulls down. This spike would be distributed to the all other columns which the hat truss was supported on... including at least 16 at the facade. This theory posits that elongation leads to destruction of axial capacity in the core and increasing loading to remain columns. Local buckling of the facade could have other factors such as the drop of floors removing bracing and effectively lowering the axial capacity of the columns. Admittedly without data it is impossible to model how the above process would progress. But we do know that post strike the only energy input which may have increased and certainly continued and spread was heat. It seems sensible that the elongation from heat would be cumulative and who knows if local cooling could cause other stresses from shrinking and warping. In addition it's also possible that some local floor areas collapsed taking with them the bracing beams. This process was ongoing, dynamic and moving through all three axes of the core consuming it's load bearing capacity. Eventually the facade was seeing loads exceeding its capacity and buckled at the weakest locations and the the entire 4 sided box with roof dropped. By that time a fair amount of the insides had already become detached and dropped.. probably in local segments over time. The final buckling drop was the coup de gras and then the process morphed into the ROOSD mechanisms which are more visually obvious. Sure the details are complicated, but I don't think the basic concept related to buckling/bowing is. 1D obviously cannot show this, but you could reduce it to 2D to roughly illustrate a plausible sequence of events involving the trusses, and the interior and exterior columns. I think you need to put that big visualizing brain of yours to this notion... and it relates to the single column failure thread from JREF... If you magincally removed a section of a column (loss of strength well below capacity works too) the line of columns has not support... that is it's loads... the ones it passed to the top of the gone column have to find some other place to go... Gravity seems to suggest that the column simply drops from the weight (loads) it carries. The load redistribution concept says that those loads move to the other end of the beams framed into the column...usually 4 others. The floors would then be cantilevered from those 4 adjacent columns. I have some doubt that this would follow. Perhaps the dropping column would pull the the floors with it... not separate from them... Maybe. Perhaps it would just be "severed" and the upper columns would be held in place by the braces of all the floors above. I would want to stand under that column... would you? I think there are only a few possibilities... the failed column line imposes a downward pull on the hat truss above or it imposes no pull and is held by the braces which now pass the former columns load to those surrounding 4 columns (maybe 8). I suppose engineers can calculate and analyze a structure if one column is taken out of a grid. Calling engineers! I have my doubts about the simple notion of lateral load redistribution as it depends on the robustness of the bracing and the axial loads they support. This thought experiment has led me to the sink hole gutting of the core and the eventual buckling of the facade and release of the remains of the upper section onto the lower one. I don't buy into the inward BOWING explanation. I agree JO. All the evidence points to the core failure leading to inward bowing, and not the other way round. The debate should really be about the mechanism that caused that core failure. What don't you buy? That the initial static displacement was caused by the trusses? You think it was all caused by some gradual sagging of the core? What do you think caused the displacement in this photo? 57 seconds before collapse. I think the floors had dropped away and a substantial part of the east side of the core had dropped and the facade was buckling under the load... When release came it was pretty obvious that all capacity on the east side was gone... both the core and the facade and that accounts for the severe tilt. Why would the trusses at the north side an the south side be pulled in? There appears to be signs of intense fire over there.. wouldn't the heating have to be BELOW? I can only speculate... but the fact the the north side ALSO is bent inwards to me is not from pulling of trusses but ABSENCE of them and the bending is the sign of buckling. Is there a pic of the north side of WTC2 buckling well before the collapse? Not sure Mick about the timeline here. But how do you reconcile the GIF and this still with respect to the north corner? Seems to me that one has to assume the distortion is buckling not pull in.. the GIF seems to demonstrate that... no? The GIF is showing the process of collapse. What did the north face look like 30 seconds earlier? You speculate, and NIST did engineering. Can you give some stuff like NIST did to support your speculation?